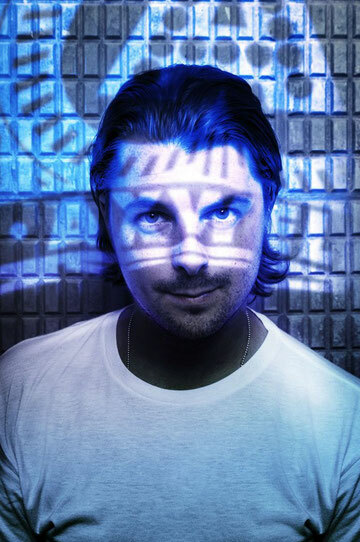 Axtone Records founder and Grammy-nominated Swedish House Mafia member Axwell has announced his plans for Miami Music Week 2012. In a week of special events Axwell brings together some of the world’s finest talent for two parties that bookend the week-long celebration of dance music. 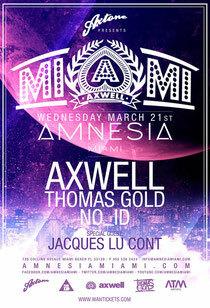 Kicking off on the evening of Wednesday, March 21 at Amnesia, Axtone presents a line-up consisting of Axwell, Jacques Lu Cont, Thomas Gold and NO_ID. 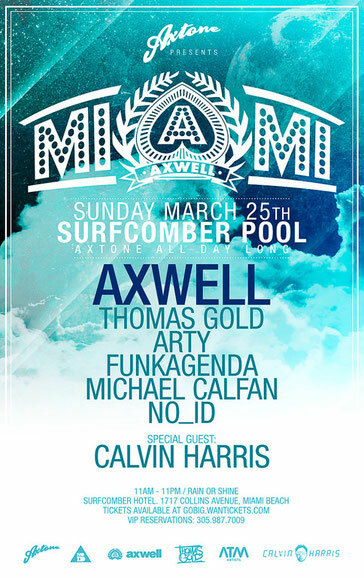 Then, the label is back with a pool party at the Surfcomber on Sunday, March 25 featuring Axwell, Arty, Calvin Harris, Funkagenda, NO_ID and Thomas Gold. Axwell is also launching a competition that will see one DJ fan win the chance to provide the opening set at both the Amnesia and Surfcomber events. Contestants will be asked to submit two mixes – one for each event – and submissions will be reviewed by Axwell, Thomas Gold and NO_ID. In addition to an opening slot at both events, the winner will also receive a complimentary flight to Miami and lodging, $500 in spending money, a meeting with Axwell and his team, and Axtone merchandise. To get involved, visit www.facebook.com/axwellofficial for more information on how to enter plus rules and regulations. There will be limited early bird tickets for both shows when tickets go on sale Thursday February 16th at 10AM EST from www.wanttickets.com.